I know when you first read this title, you had your skepticism… so let me clarify a few things. Our startup is ~6 months old and has raised a $350k seed round. We started charging our customers on Feb. 8th, 2013 and saw our bank account have more money than it had the previous month in early May 2013. To provide transparency with #s, we are currently projected to make over $300,000 in annual recurring revenue (and we’re not close to our potential ceiling). You may call it “ramen” profitability, but I call it finding product market fit, not at the mercy of begging investors for more money, focused on scaling a profitable business, and being able to call the shots now. Chart of our bank account. 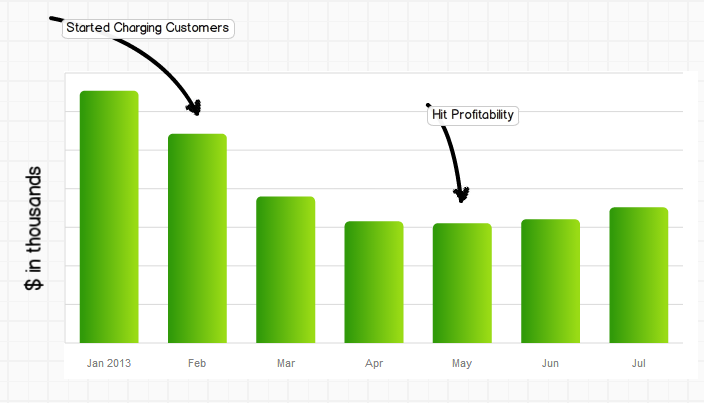 Profitability hit in May. As I reflect on how our startup reached profitability, I am extremely proud of my team and how far we’ve come. We’ve been together for a 1.5 years, failed on a previous product, and had tons of constructive arguments along the journey. It wasn’t easy as we made some very tough calls that pissed off a lot of customers (more on that later) and had many scoffs from skeptics since our team are all first time entrepreneurs. Now I’m not advocating that all startups have to focus on revenue and profitability, but because of certain situations, we had to focus on that. Firstly, we are a B2B company, so we’re not in the business in wild, viral growth. Secondly, and the most important, we failed to raise a Series A. Whether it was our “inexperience” or our lack of “market potential,” we couldn’t seem to close with an investor who saw our vision. So we raised our middle fingers to all our doubters and decided to take action. We told ourselves we were going to hit profitability and prove all the skeptics wrong. And we did just that. Here’s how. One of the first and most important decisions we made as a company was to charge our customers 2 months into launching our product. Many “experts” and investors will tell you not to because 1) it stagnates user growth and 2) your valuation will now be based off revenue. Both are correct, BUT ask yourself why you’re building a company. Is it for maximum cash in the end or for truly creating something valuable, sustainable, and an actual business to be proud of? Investors are for the former, while (most) entrepreneurs like myself are after the latter. Of course investors are going to tell you NOT to charge your users (maybe until years from now) because they want your business to grow as quickly as possible and hopefully make a big, fast exit. It’s their job; they need to make home-run bets and not have any obstacles stagnating growth. But it’s a HUGE risk, and prone to failure for the entrepreneur. I hate to say this, but if you fail, you’re just another portfolio company that is a simple “well, at least we tried” while you the entrepreneur have to restart your life after just investing X amount of years into the now bankrupt, shutdown company. It’s a numbers game for investors, while it’s your real life at risk. That being said, I am a big proponent of testing your business model as early as you can. 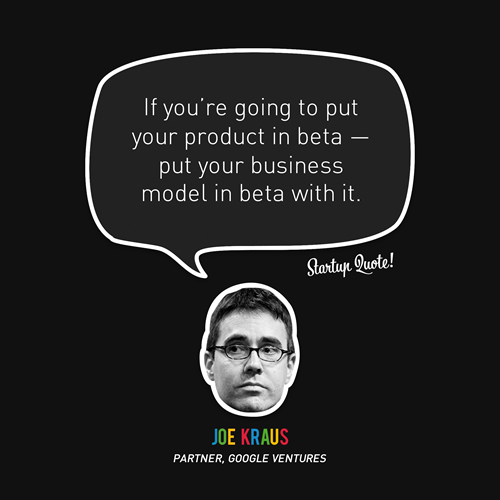 That means make your users pay for using the product you put hard sweat and tears in. You will not have your pricing perfect, but if you know someone is willing to pay you his or her hard earned money, you now know that you may actually have a company. I remember when we landed our first customer 24 hours after we launched our payment system, our team was ecstatic. It was a huge boost to morale and gave us confidence that we were solving a problem that someone was willing to pay for it. You’re much better off hearing someone who says they will NOT pay for your product and ask them how to improve than building blindly because you are afraid of charging your customers. It was when someone wise told me that I finally realized our company had taken the safe route and charged very little to avoid criticisms from customers early on. Like many startups, this is very normal. NO ONE knows what their product is worth in the beginning, so they start off with a small price to play it safe. We do this because we don’t want someone telling us how ridiculously pricey our solution is. The best thing to do is to figure out who your target customers/segments are and then ask them questions. Ask them how much they pay their developers per month to build the same solution they want to buy from you. I guarantee you that your priced solution will always be cheaper by at least 5-10x per month what they pay their developers. The other thing to do next is to see how much value you would be providing. Value means time and money saved. If you can save someone a month time of development and thousands of dollars of saved maintenance costs, that’s HUGE value and you should be charging a lot more! If the prospective customer need your solution and yours is the best, they will pay for it. Now we decided to charge at least 5-10x our first business model assumption after a few months of learning and realizations. Let me tell you… we got a lot of user complaints, but to be honest, IT MADE ALL THE DIFFERENCE. You have to remember that customers will complain because all they care about is themselves. They want the best solution for the most affordable price, and won’t ever understand or care about your pricing judgments. Read this blog post from an anonymous company and you’ll know what I mean. That company decided not to focus on charging their customers and the result is they have a few days to live before they shut down. Do you think any of their users will really care about the founder’s life and his well-being after closing the business? Everyone looks after their own businesses, so make sure to look after your company and that it can sustain by charging customers more. A case study highlighting that increasing prices have the most dramatic effect on profits increasing. Another thing I learned is that when you charge more, you will seem more legitimate to potential large customers. Simple as that. If I offered you a $1 pen and a $100 pen, you’re going to question the $100 pen. I will explain to you that it can do this and help you with that. As a big business, you will be more likely to purchase the more expensive pen because you want to know you have the best version of the product and not be restricted on anything. I’ve seen big companies actually not purchase from a company because they were charging so little (yes, one of them being us). Whether it be because it seemed too sketchy or because no big company wants to put a line item of $10/month on their large expense report, just know that when you charge more, you seem more legitimate to big brands and may have a better chance closing with them. 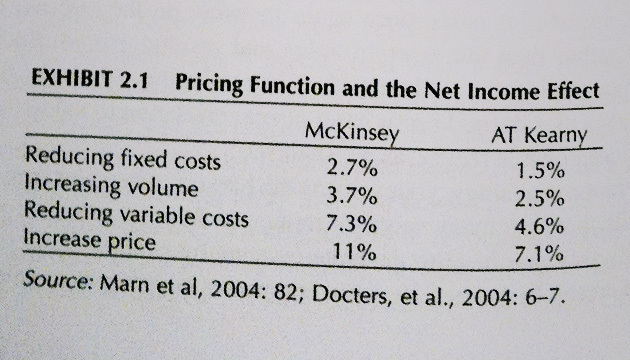 Not advising to just charge more for the sake of it– but this is a key factor when pricing your solution). Companies are spending corporate budgets. They have to spend it so they can at least show their directors that they are working towards efficiency. If they don’t spend it, the extra money gets taken away from their next year’s budget. So they will spend it… why not spend it on you?? So if you charge early and charge more, none of that will matter unless you have a working, effective distribution strategy. Please don’t have the “we’ll build/launch and they’ll come” approach because that rarely works. Carefully think how your customers can either find you or how you will get to them. Put yourself in your customer’s shoes and imagine their problem. What could you do to reach them with your solution? Here’s how we did it. Our blog today is the sole reason we get about 200+ businesses to sign up everyday to our service without us needing to do anything. I’m not going to go into too much detail of blogging effectively, but if you want to read more, go here or here. The key takeaway is to blog about what your customers will be searching for. Our target customers are businesses who need ways to get the most out of their social media efforts, so we blog tons about how to get more followers, how to maximize social media reach, tips on effective social strategies. We optimize on very specific keywords (use Google Adwords Keywords Tool), so whenever someone searches for those keywords, we will be on your first results, if not page. They will click on the blog, read it, trust our brand more because we helped them, and click on our product to learn what we do. If Tint solves their problem, they will make a purchase after. 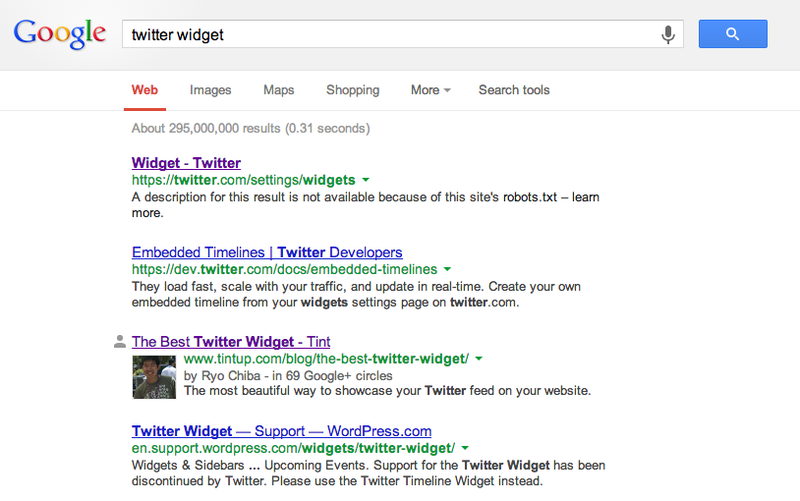 3rd result on “Twitter Widget.” Searched 165,000 globally per month. 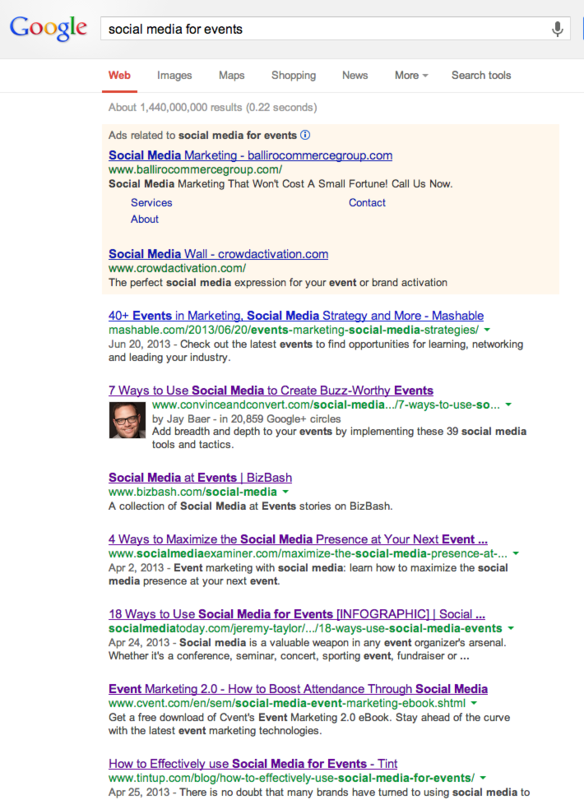 7th result on “Social Media for Events.” Searched 7000 times per month. 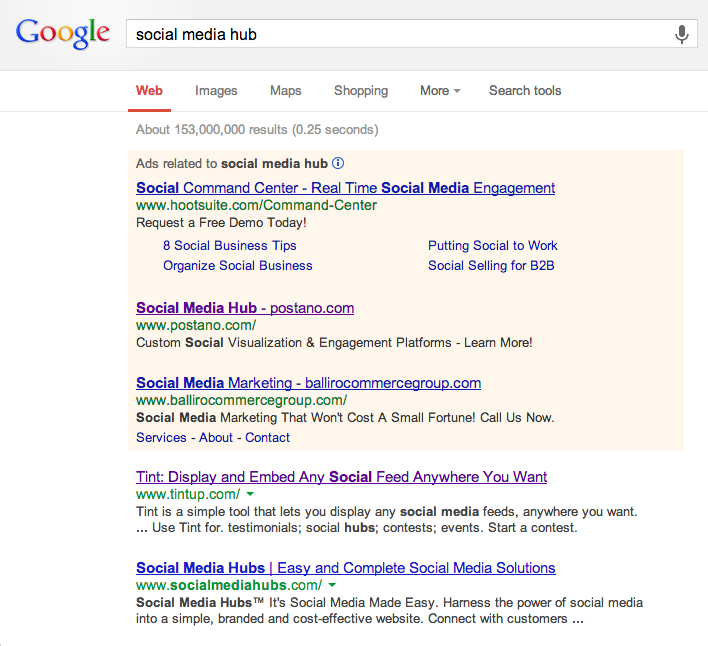 1st result for “social media hub”, searched around 2,000 times per month. Think about businesses your potential customers are already customers of and see if you can partner up with those certain companies. In our case, we partnered up with CMS builders where a ton of our potential customers were. We have partnered up with agencies and other companies where social media consultants are abundant. This may take a long time to close, but if you can close with these businesses, it can act as a barrier to entry for new competitors and a ton of potential customers introduced to your product. Turn your customers into your best marketers. Make it easy for your existing users/customers to refer to their network of your product. That’s obvious, but here’s another tip you can use. Personally reach out to your biggest/influential customers and ask if they could introduce you to some of their networks. Instead of coming off sales-y, let the customers know that you want to be introduced so you could showcase how well they used your product. Make them look good in front of their peers. This will come off as a nice compliment to your customer and a great case study for your new warm lead. The last thing that I truly believed helped us hit profitability is our obsession over quality, flawless customer service. That doesn’t just mean picking up the phone and answering support emails. It means placing your support email address on as many places as possible to encourage communication, installing a live chat window to close warm leads on our splash page, a open-sourced forum for our community to discuss and provide transparency, surveys around our pricing page to get quality feedback, and a helpdesk placed strategically inside our dashboard to answer feature requests. We even have emails sent out whenever someone decides to leave as a customer. We love to know everything we can to provide the best experience for our customers. On top of that, we take all support emails and phone calls seriously as we sincerely believe that the first impressions we provide for our customers make all the difference. We answer every single support email and call back any missed calls. All these tools and avenues we provide for our customers seem like too much and overlapping, but each tool serves a different purpose during different parts of the user experience. The live chat window on our splash page is to ease people to sign up, the forum is to allow other users to talk with one another and trust our brand, the surveys is to get an understanding of what our customers think, and the helpdesk is used to understand what features our customers want after playing with the product. There are obviously a ton more factors that went into play to our journey of hitting profitability (like how to properly determine your product roadmap, how to effectively close sales after cold emailing, or how to translate customer feedback into actionable learnings), but these 4 tips I mentioned are the most practical and made the most difference for us. My last advice is that as a startup or entrepreneur, you’ve got to make risky calls and learn as quickly as you can from them. If you play it safe, you’ll never see serious growth or changes. Our first big call was to charge people. Our second big call was the increase our prices. And our third big call was to not decrease our prices. Every time we made a big call, we spoke with every customer we could to get feedback as quickly as possible. If you made it all the way here, I hope you were able to learn something. If you liked it, please share this with your peers or other startup founders. My hope is that someday we can stop reading about funding as the “success” factor on the tech news and hear more about businesses doing what businesses are supposed to do: generate revenue and make profits. This is fantastic Tim! The last line could not be more true. Proud of what you guys have done over at Tint. Congrats buddy! Thanks Brian! Really appreciate it man. Let me know if I can ever help you with anything too. Hey Tim – really enjoyed your post! Results of the right attitude! Thanks Sarah! Appreciate the kind words and let me know if you’re ever up in the city. Would love to chat more in person! Thanks for sharing the amazing tips. Tim. Keep it up!! You’re welcome DH. It’s been some time but hope all has been well too. Let me know if I can help you with anything! enjoyed learning about your journey and the persistence. congrats! looking fwd to your continued success! Thanks Jerry! Appreciate your kind words and support. Will keep you posted on more articles and progress. Tim, I really enjoyed this piece. I want to send a big thank you your way. I’ve worked for a startup for two years now: Buildipedia.com. The site is ready to close the doors this summer because they never got around to turning it into anything resembling a business. As a web designer, this frustrated me to no end for the past two years. Seeing BDM after BDM come and go with no real ad sales growth. Finally, myself and the development team over at Kinopicz American took a heavy look at our revenue possibilites. We sat down and really examined how we could make money with this type of resource. Check out the advertising pages over at http://buildipedia.com/about/advertising to see what we came up with. The really frustrating part is that we have the opportunity here to really create something cool but I fear by August we’ll be shutting the doors. Good post, as I look for my next opportunity, I’m going to keep all of this in mind. You’re very welcome Raymond. I’m sorry to hear your situation, but I’m glad to hear you’re taking it as a learning opportunity. We all learn most from failures, so I admire you’re positive outlook. It’s a scary thing to shut the doors, and more startups need to go through this feeling to understand that revenue and sales cures all. Let us know if we can help with anything and stay tuned for more learnings we’ll be sharing! You are very welcome! Stay tuned for more great posts like this soon! Reread this again and I want to commend you on your maturity and ability to separate your enthusiasm from the circus that is fundraising. I didn’t realize you were struggling with the series A. I could of personally helped and I wish I had known back then. Buffett always says he invest in people and I saw the same characters in you when we first met. Fight on! I am saying that being a Bruin…. Thanks Jonathan for the kind words. Always appreciate your support and offer. We’ll see what happens in the near future :). Tim – love the conviction of your blog. For ongoing profitability, research into your market is also important… Both in B2B and B2C settings. Keep up the good work! Great post and extremely helpful for startupers. Thanks for the great read Tim. Some home truths in this one that almost made me cringe once or twice when I pondered on just how much our startup has actually NOT been doing some of these things. As they say on Twitter, feeling #inspired to meet with the other directors and introduce at least one or two new strategies! I first saw this on Jay Baers blog and have been trying to get my college department to start using it ever since, but the IT department is opposed to it. You should start targeting them as potential customers! It’d be so much better to see latest announcements and all the updates on social media feeds for the department routed on the main website…… https://engineering.purdue.edu/NE …. That would look so much better! Keep up the good attitude and the hard work! You’re going to do great! We are starting to target schools now! If you have any tips or recommendations, please send them our way :). Appreciate your insights and can’t wait to see more schools using Tint. You’re very welcome Josh. Glad you found it useful and enjoyed the read. Hopefully you can extract some of our hard learnings into easy implementations for you :). Appreciate the kind words and stay tuned for some more great posts coming you way! Thoroughly impressed, thanks! Keep posts like this coming! product” is really useful especially for many first-time entrepreneurs. budget” is relevant for determining how much most startups should charge. Glad you find most of the article agreeable. These are harsh learnings we went through firsthand. Also, the “need to spend their budget” is referring to big businesses (who are our core customers). Apologies for not specifying that, but for all startups who target larger corporations should definitely use that approach. Thanks for the clarification Tim! Looking forward reading the next one! Excellent post. I’ve been searching for SEO tips for along time and I think this is one of the best. Transparent results and right to the point 🙂 Question though: If the first sale was done in 24 hours, how did you go about generating the buzz for people to notice your site? A lot of hustling and emailing similar competitors / companies (of the customer who bought from us). Love the middle finger to the doubters 🙂 Great story. Awesome Post. (Bookmarked). Hope to do business with you guys one day. I have a start up in the Digital Out-of-Home advertising sector. Will def apply these tips. Thanks! Thanks and we’re always open to working with those interested in our product :). I’m wowed, fantastic actionable tips – thank you Tim! Hey tim- i m very happy you start and do good !! Thanks Tim! Enjoyed the read and will be sharing with my team. Ironically, much of what your stating here I have been implementing utilizing my own intuition. This article was just what I needed to let me know I was going in the right direction. Thank you! Regarding the price aspect, I couldn’t agree more. I was told by many to “give it away” to increase memberships, but the cost of my programmers are high and would eventually be the death of me. We charged low (and I’ve had a few companies walk away because we were too low) but we’ve started raising the price up and listening to the responses. So far no one had really balked which tells me, it might be soon for us to do it again. Fantastic to hear! So happy to hear :). We’re always here to help so let us know. Great post. The startup I’m at is just about at the stage where we’re asking these same questions. It’s amazing how when you take a step back the answers almost always boil down to – listen to your customers and use a bit of common sense. Congrats on the success, and thanks for sharing your thoughts and story! Excited to read parts 2 and 3. Very inspiring Tim! Keep up the good work. Best wishes. Hey Tim, thank you for a sort of a case study. It’s really insightful. Loved you raising the price regardless of your customer’s say and the example was spot on: regardless if you chose the $100 pencil, it caught your attention.